We feel that over the next several years, the Greater Waterbury and Central Connecticut regions will experience unprecedented growth and revitalization. The professionals at the Francis T. Zappone CO. are ready to assist you with all of your real estate needs to help make your real estate experience rewarding. We hope this web site will acquaint you with our Company and that, as a result, you will choose the Francis T. Zappone CO. to serve all your real estate needs. We encourage you to contact us for complete Real Estate Services. Thank you for visiting our web site! 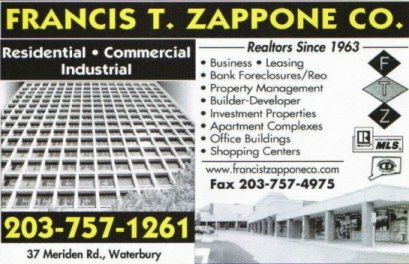 As you look at new homes, commercial, industrial and investment property possibilities, here at Francis T. Zappone CO., we are available to assist you with the complete process from property selection, information needed for your loan application, due diligence and financial terms. Please feel free to contact us if you have any questions.